The 1-3 Carolina Panthers will host the 1-3 Tampa Bay Buccaneers for a NFC South clash in Week 5. You can read all about Monday Night Football Best Bets in this preview. The Panthers are coming off a 48-33 loss at Atlanta as a 2.5-point favorite while Tampa Bay was shut down in a 27-7 home loss against Denver as a 3.5-point dog in Week 4, its third consecutive loss since a season opening win at Atlanta. The bookmakers opened this game Panthers -4.5 points, but you now have to lay at least five points to back the favorites. The wagers have come in fairly even on the spread with a slight advantage for Carolina while close to 60 percent of the bettors think this game will go over the total of 46 points. Last week’s defeat to Denver marked the second time in three games that the Bucs were held to seven points. Jameis Winston couldn’t get much going in the air against one of the league’s top defenses. He completed 17-of-35 passes for 179 yards with no passing TDs and two picks. Tampa Bay didn’t do much better on the ground with just 72 rushing yards while its defense struggled with Denver’s second string QB after knocking Trevor Siemian out of the game. The Bucs are 4-0 ATS in their last four games following a double-digit loss at home but 1-7 ATS in their last eight games overall and 1-4 ATS in their last five road games. Carolina must be mightily disappointed with its start to the season. It could get even worse as Pro Bowl QB Cam Newton suffered a concussion after taking a big hit from Falcons linebacker Deion Jones last week and has been ruled out for this contest. Derek Anderson came in behind center and completed 17-of-23 passes for 172 yards with a pair of touchdowns. He also tossed two picks though, including a game-clinching pick-six. Carolina had one of the league’s stingiest defenses last season, but it was carved up to the tune of 503 passing yards by the Falcons who lost to Tampa Bay in Week 1. The Panthers are 7-0 ATS in their last seven games after allowing more than 250 yards passing in their previous game and 11-4-1 ATS in their last 16 home games vs. a team with a losing road record. They’re however just 1-4 ATS in their last five games overall. Carolina has won six straight meetings dating back to 2013, and the Bucs are 1-5 ATS in those games. 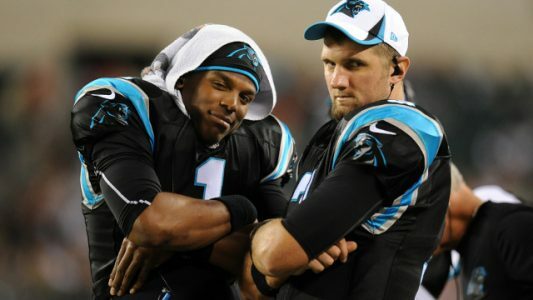 Derek Anderson made two starts in place of Newton in 2014 and beat the Buccaneers twice. The Bucs have conceded 104 points in their last three games, but it’s hard to back the Panthers without Cam Newton. We are looking for a low-scoring game at Bank of America Stadium Monday night.